It was love at first sight from the moment we laid eyes on this fabric! We knew we had to bring it to you. We're all about texture these days and this slub weave fabric has such divine texture that we are head-over-heels in love. 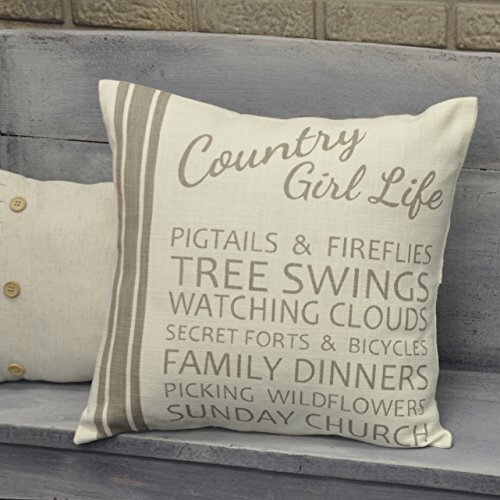 Soft yet sturdy, the cover is stenciled with "Country Girl Life", and other fun text. A grainsack stripe runs along the lefthand side of the pillow and all details are in taupe grey. So pretty for your farmhouse chic, rustic romance, or modern country style bedroom! Textured cream cotton slub chambray fabric; Reverses to same as front; Features 2 wooden button closures plus 1 spare hidden button with 3″ overlap to conceal pillow insert; Pillow cover only, insert sold separately. Textured creme cotton slub chambray fabric; "Country Girl Life" and other fun text stenciled in taupe grey, accented with one large grainsack stripe down left side; Turned edge seam; Reverses to textured creme cotton slub chambray fabric; Features 2 wooden button closures plus 1 spare hidden button with 3" overlap to conceal pillow insert; Machine stitched; Single fabric. We're all about texture these days and this slub weave fabric has such divine texture that we are head-over-heels in love. It has a sturdy yet soft feel and drapes gorgeously! A touch of ruffles add romance to the rustic home-spun like fabric. So pretty for your modern farmhouse, rustic romance, or country chic style bedroom!